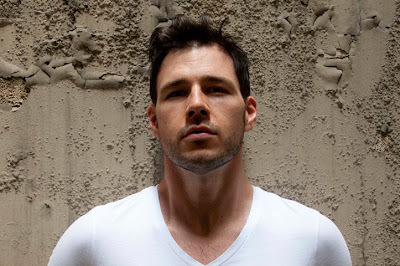 When we last featured Aussie barihunk Damien Pass in 2007, he had recently graduated from Oberlin, had won and Encouragement Award from the Marilyn Horne Foundation Competition and was starting to get small roles in places like Glimmerglass Opera, Opera Theatre of Saint Louis, Opera North and the Music Academy of the West. Somehow we lost track of him until we received an email recently asking why he wasn't included in our poll of sexiest Aussie barihunks. We're pleased to announce that we found him in France, where he's been singing smaller roles at the Paris Opera. He's performed Don Inigo (L’heure Espagnole, Ravel), Frank Maurrant (Street Scene, Weill), Lucas (Les Troqueurs, Dauvergne), and the Marquese (Mirandolina, Martinů) with the Atelier Lyrique at the Paris Opera. In September 2001, Pass made his Parisian recital debut with the Fesival les journées romantiques with a program that included Aaron Copland, Franz Liszt, Cole Porter, Franz Schubert and Henri Duparc. He's also made his mark outside of France, singing the title role in Handel’s Saul with the Britten-Pears Orchestra conducted by Richard Egarr in Aldeburgh. Pass will next be seen March 15th at the Palais Garnier in a program of Massenet with the Paris Opera Orchestra. A week later he'll be part of a concert of music by Franz Schubert, Hugo Wolf et Richard Wagner at the Goethe Institute in Paris. We'll try to keep better tabs on this promising young talent in the future.